Boyd P. W., Strzepek R., Fu F. X. & Hutchins D. A., 2010. Environmental control of open- ocean phytoplankton groups: now and in the future. Limnology and Oceanography 55:1353-1376. Brose, U., J.A. Dunne, J.M. Montoya, O.L. Petchey, and U. Jacob, eds. 2012. Climate change in size-structured ecosystems. Theme Issue of the Philosophical Transactions of the Royal Society B 367:2903-3057. Doney, S.C. (2010) The Growing Human Footprint on Coastal and Open-Ocean Biogeochemistry . Science 328, 1512; DOI: 10.1126/science.1185198. Gattuso J.-P., Mach K. J. & Morgan G. M., 2013. 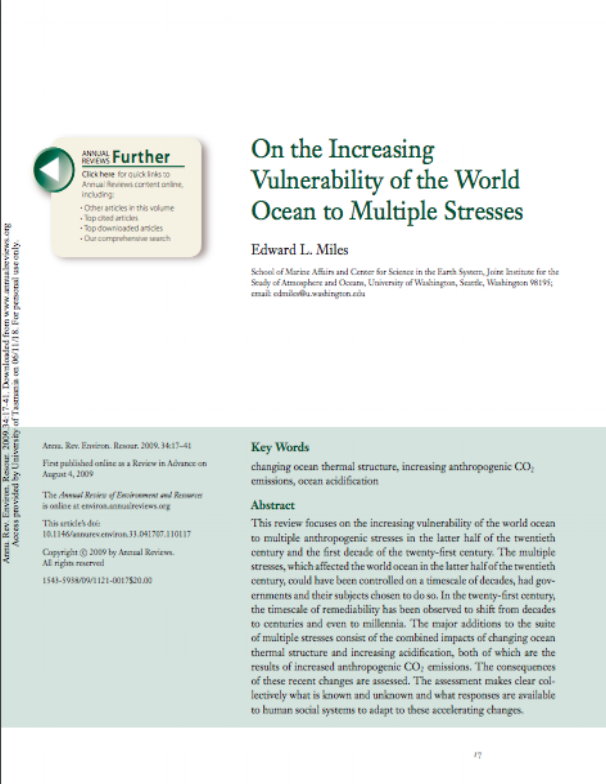 Ocean acidification and its impacts: an expert survey. Climatic Change 117:725-738. Lohbeck K. T., Riebesell U., Collins S. & Reusch T. B. H., 2013. Functional genetic divergence in high CO2 adapted Emiliania huxleyi populations. Evolution 67:1892-1900. Riebesell U., Fabry V. J., Hansson L. & Gattuso J.-P. (Eds. ), 2010. Guide to best practices for ocean acidification research and data reporting, 260 p. Luxembourg: Publications Office of the European Union. Calbet A, Sazhin AF, Nejstgaard JC, Berger SA, Tait ZS, et al. (2014) Future Climate Scenarios for a Coastal Productive Planktonic Food Web Resulting in Microplankton Phenology Changes and Decreased Trophic Transfer Efficiency. PLoS ONE 9(4): e94388. doi:10.1371/journal.pone.0094388. Cooley S., 2012. #OHCO2 What? New directions at the Ocean in a High-CO2 World Meeting. OCB Newsletter 13-17. Gattuso J.-P., et al. 2014. Free-ocean CO2 enrichment (FOCE) systems: present status and future developments. Biogeosciences 11:4057-4075. Riebesell U. & Gattuso J.-P., 2015. Lessons learned from ocean acidification research. Nature Climate Change 5:12-14. Rose, J.M., Feng, Y., DiTullio, G.R., Dunbar, R., Hare, C.E., Lee, P., Lohan, M., Long, M., Smith Jr., W.O., Sohst, B., Tozzi, S., Zhang, Y., and Hutchins, D.A. (2009). Synergistic effects of iron and temperature on Antarctic phytoplankton and microzooplankton assemblages. Biogeosciences 6: 3131-3147. Schaum E, Rost B, Millar AJ, Collins S. 2013 Variation in plastic responses of a globally distributed picoplankton species to ocean acidification. Nature Climate Change 3, 298–302. (doi:10.1038/ nclimate1774).